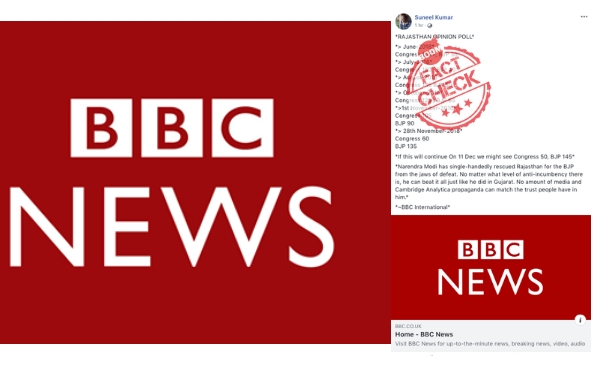 Fake news creators add BBC’s home page link to make a fake opinion poll look credible. Click here to view the archived version of the post. A Twitter handle Rishi Bagree with a large following of right-wing sympathisers shared this post as well on Twitter with numbers changed from November. His tweet got more than 2,000 retweets and 6,000 likes. However, Bagree has not attributed the poll to BBC, and neither mentioned the source of the opinion poll. This is not the first time Rishi Bagree has been caught sharing fake news. In the past, Bagree has been called out by BOOM many times. Click here, here and here. BOOM spoke to a senior editor at BBC, who called it fake. We were asked to refer to their statement published on The BBC Hindi website. This is not the first time fake polls claiming BJP’s win have emerged on social media. During the Karnataka elections earlier this year in April-May, there were many such fake polls viral on social media. One of the polls even had the same pattern and had an attachment of BBC’s link to it. BOOM had debunked the viral message then. Not only this, but there were other fake polls that were viral at that time which BOOM had debunked. Click here, here and here to read about those polls. 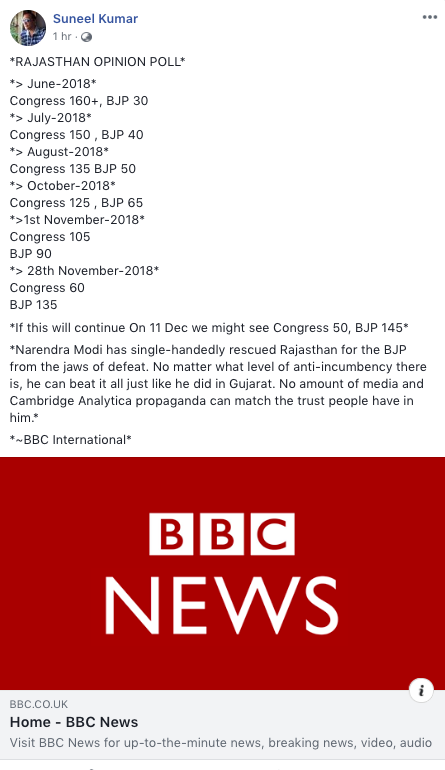 Editor’s Note: The handle @rishibagree mentioned on Twitter that he never attributed the opinion poll to BBC. We have amended the story to reflect his clarification. However, the numbers mentioned in his tweet are similar to the numbers mentioned by those attributing the poll to BBC.